A DREAM CHAT WITH MICHAEL POWERS 17 years after I first saw him! MICHAEL POWERS: A REFRESHING UNIQUELY MULTI-TALENTED MASTER... "New York is one of the centers of global music. And yes, that means big name celebrities and artists, but it also includes countless professional musicians who pay the rent and support their families by performing week after week, year after year." Bluesfest has a tradition of delivering a few pleasant surprises, usually on the lesser stages. Saturday, it gave us Ray Bailey and Michael Powers, both notable for their quality but also worth noting because blues fans have the opportunity to see and hear them again today â?? Bailey at the Barney Danson Theatre and Powers at the Hard Rock stage. 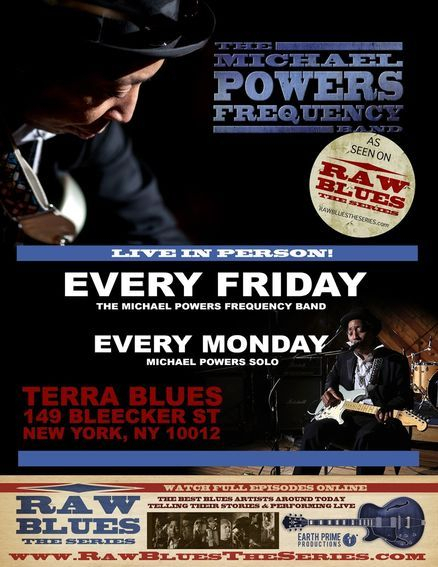 2 hours, 2 Blues men, 3 guitars, 1 harmonica, FANTASTIC LIVE SHOW at the famous TERRA BLUES on Bleecker Street EVERY Monday 7:30pm! Sunday, Nov. 09, 2008 Michael Powers en Bogota "Yesterday saw the return of Michael Powers to Bogota and did well to stay put in the hearts of those who love the blues. OnJuly 23 last had left a small footprint music, some touches of talent and we were left disappointed but last night and, in the Hamburgueseria 93, was that we were facing a star. At 10:30 the night of the concert began. Michael Powers on guitar, veteran Sarah McLawler on the B3 organ, the phenomenal Pinky Mendez on bass and the huge Neil Burton on drums. In a small apretujados where some (but certainly well in the stands are usually present in New York), these musicians show us all the energy of their blues. Starting with "Killing Floor", a traditional topic of Howlin 'Wolf, which lit the night, in which the register was going through different styles of blues (slow, country, boogie) and to entertain the audience with incredible versions of songs like "Hey Joe" (it envied Jimi Hendrix) and "Going down", which eventually convinced us about the brilliance of Michael Powers. It really was very pleaseing to see this great musician, this time accompanied by Sarah McLawler who proved to be the best or perhaps the only woman who plays the Hammond B3 organ, and with little time as leader of the gang, along with the great Neil Burton and the fantastic Pinky Mendez, led the public to special moments. Michael Powers again felt his power in a land that is gradually opening the doors to the blues. 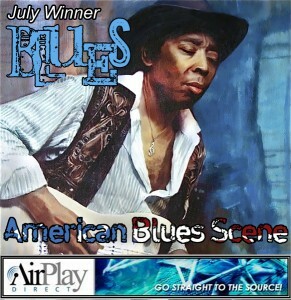 -www.historiasdelblues.wordpress.com""
"BB" is pleased to present this interview with Michael Powers. We spoke with him recently and found his dedication and passion for his music is an extension of his dedication and passion for life. And his music is for everyone... Michael Powers is a modern purveyor of powerful, emotional and spiritual music.